Are you sadly unsavvy in the kitchen? Or maybe you just don’t have time for all the meal planning and grocery shopping? Pull a culinary con on your family or friends by ordering from Plated, a popular meal delivery service. No grocery shopping, no ingredient measuring. Just healthy and eco-friendly meals you can whip up in less than an hour. What Meals Does Plated Offer? How Do Customers Rate Plated? Get $25 off your first two Plated orders via this link. Here’s a sampling of just some of the meals and desserts you can choose from for one week. Plated was the first meal kit we ever tried; several years ago after seeing them on Shark Tank. It was fun with lots of exciting meals and cuisines to try, but we have since moved more towards Sun Basket due to changes in our personal diets (dairy-free, wheat-free and organic when possible). A friend was raving recently about Plated, so we decided to give it a go again. Plated gives you several options on their website to select the number of servings per night and how many nights per week you want to make their meals. They also allow you to filter the meal options by Vegetarian, Seafood, Gluten-free, etc. which was very helpful in narrowing our choices, especially given our limited options these days! However, it does not have a vegan or even a no dairy filter, so that made this part of our recipe selection quite challenging. I had to click on each potential recipe and review the ingredients to find out if they contained dairy or not! But, eventually, I was able to make my meal selection work, for the most part. Once the Plated box had arrived, I was able to confirm that the packaging was very comparable to most other services we have tried. The recipes cards featured big colorful photos that got me excited to get started! The meals were tasty, and the portions were large (we ordered enough for two servings per meal but made 2.5-3 servings). On the negative side, the recipes involved too many bowls, pot and pans (lots of dishes to wash!) and they took a little longer (30-50 minutes rather than 25-35 minutes with most of the other meal kits we’ve tried). It was delicious and if you like eating more adventurous, global cuisine, Plated is a great option. However, for our special diet needs, there are definitely better options. In addition to Plated recipes, one of the things we love about Plated is their video series that shows you how to make everything from brown butter sauce to homemade salad dressing. Here’s how to make the perfect soft- or hard-boiled eggs. 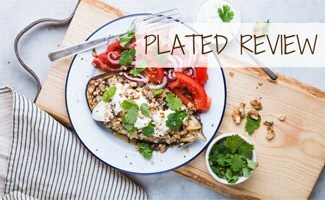 Plated gets two thumbs up from us. Sure, it might be a bit on the pricey side, but it’s hard to beat their attention to spices, flavors and global recipes — not to mention their eco-friendly meals and packaging. Still not sure? 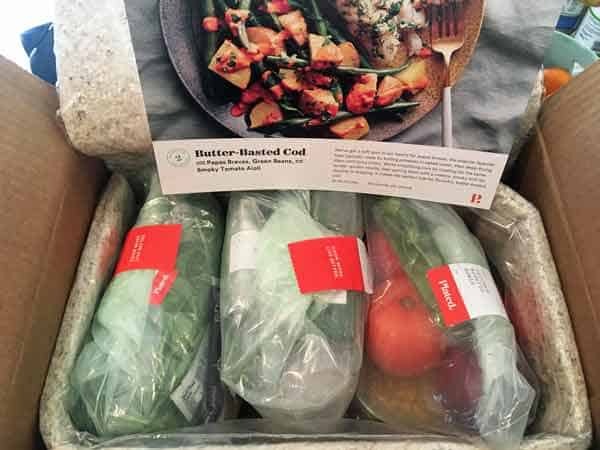 Check out Plated competitors in our Best Meal Delivery Service review, where we rate 10 of the most popular food delivery services. Why are you thinking about using Plated or switching to Plated from another meal kit service?